Every day is bake day at The Pantry. We bake, we test, and we share the good stuff with our customers in the store. Last Friday and Saturday, we made cakes using our Vanilla Bean Baby Cakes mixes and then topped them with fresh or frozen fruit, sauces, and flavored whipped cream. When we got them right, they were luscious. 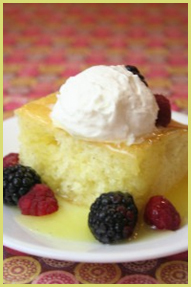 The Vanilla Bean Baby Cakes mixes are cream cake mixes, denser and moister than the fluffy mixes from the store. They are about half way between the fluffy mixes and a pound cake. 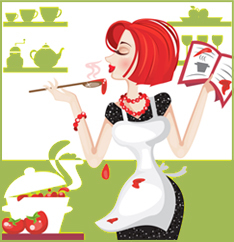 With more substance, we think they are more suited for these desserts. Lemon and raspberry is a great combination. We made the lemon sauce from a mix and then added raspberries. 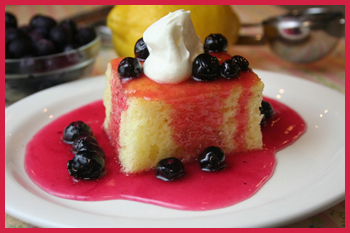 We concluded it was better not to mix them, rather, pour the lemon sauce over the cake and add the berries. We tried several flavors of whipped cream. We liked the lemon cloud whipped cream the best. Step 1: Make the cake according to package instructions. Step 2: Make the lemon sauce according to package instructions. Step 3: Make the lemon whipped cream according to the recipe below. Lemon and blueberry is a classic combination. We liked the berries mixed right in the lemon sauce. It made a beautiful pink and magenta sauce. The lemon cloud whipped cream was really the only choice for this dessert.